This is the first of a number of upcoming Scissor Fob tutorials … and is the type of finishing used by The Drawn Thread freebie designs and similar to Mill Hill treasure ornament series. The finish is a diamond shape, which I think is really attractive for a scissor fob. 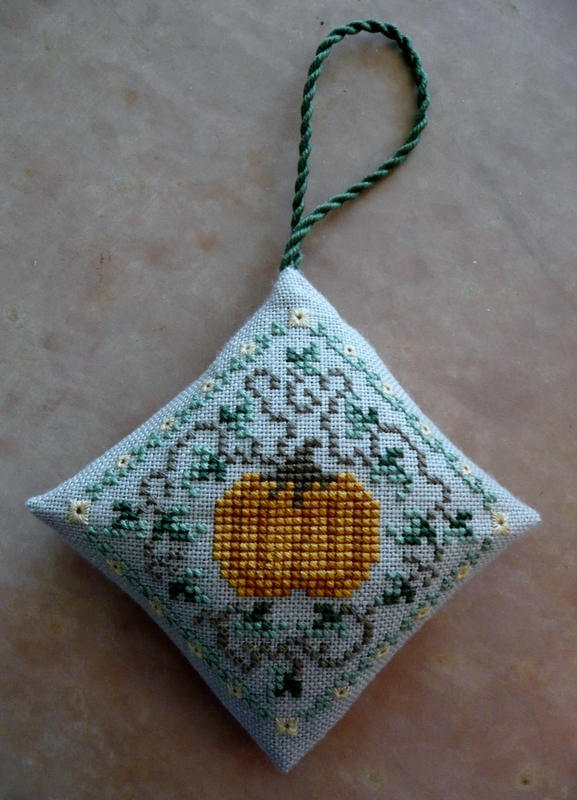 This one in my tutorial is a bit large for a scissor fob, in my opinion, but the finishing is the same irrespective of the design size you choose 🙂 If you are interested, this is Pumpkin Keeper freebie by The Drawn Thread. 1. 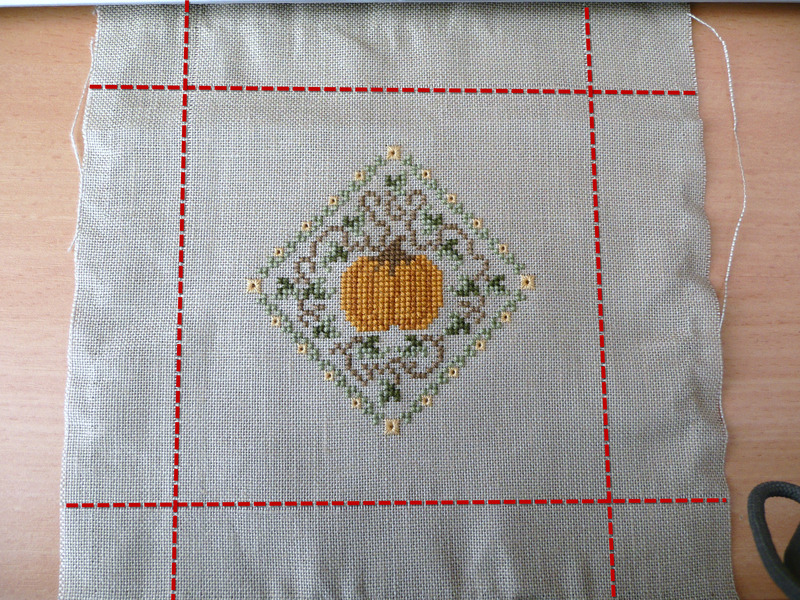 Ensure you have equal sides on your stitching – the easiest way to do this is to count the number of squares away from each of your piece if stitched on aida, or count a specified number of threads away from each side when stitching on linen. 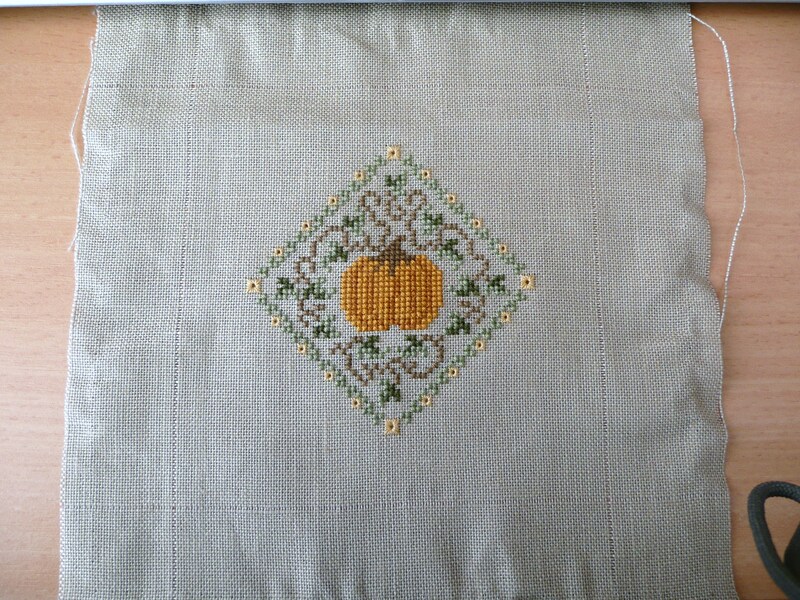 In this case I followed the Drawn Thread instructions, which was to count out 24 threads away from the stitched area and cut off the fabric edges. 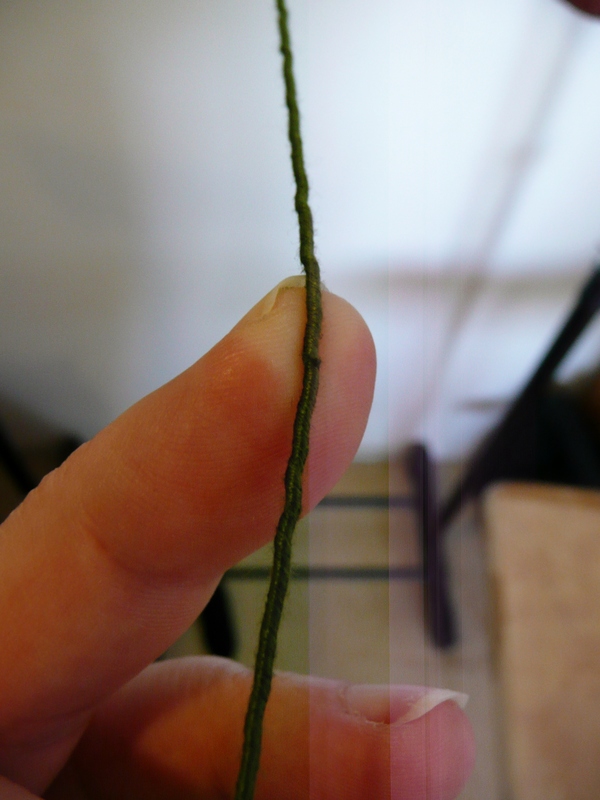 I find the easiest way to do this is to count out your designated number of threads then remove the next thread, ie pull it all the way out – this leaves a clean channel for cutting a straight line following the weave of the linen, as you can see in the photo below. 2. 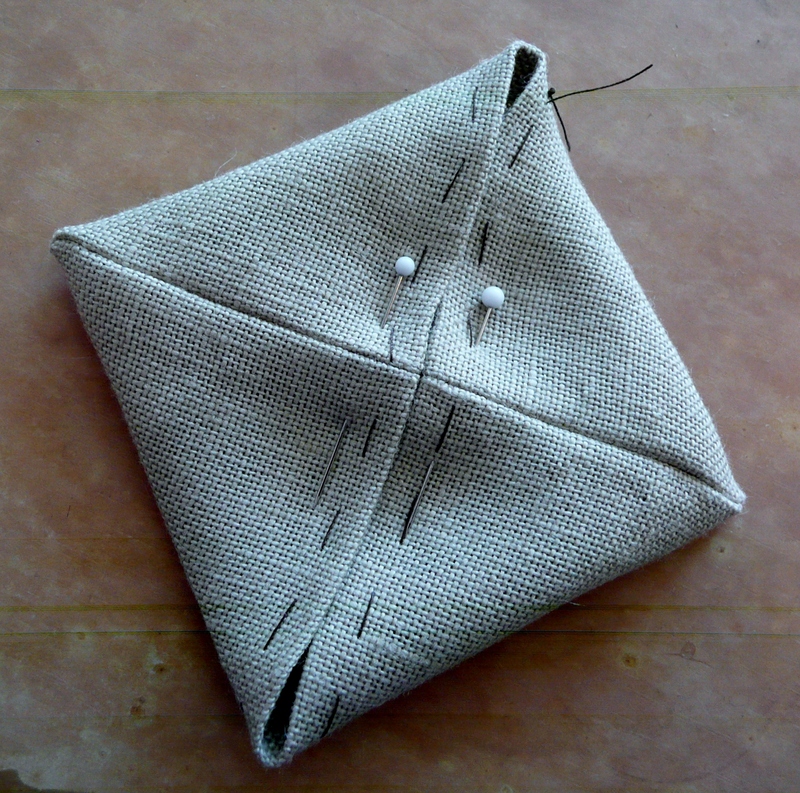 Once you have cut away your edges and have a nice square piece of fabric, fold your stitching in half across the centre of the design, with the right side of the stitching facing each other. 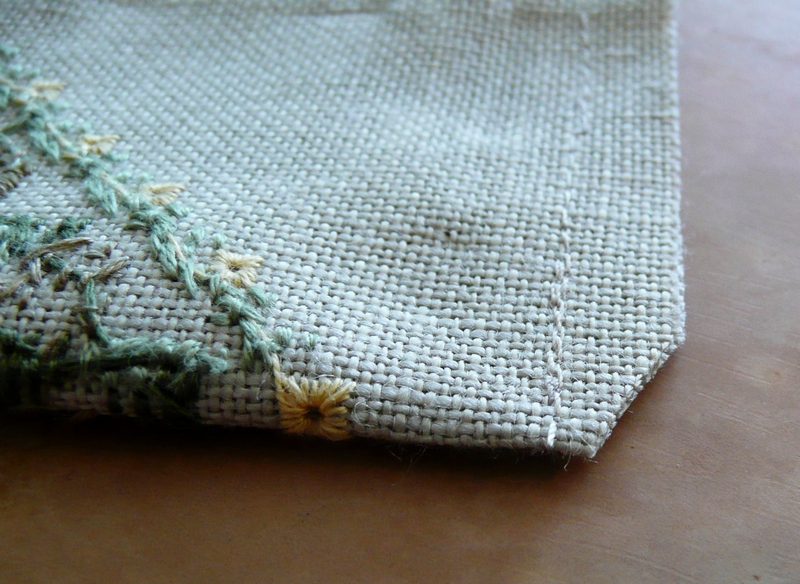 Pin the edges together, and stitch a seam allowance at each of the short edges. 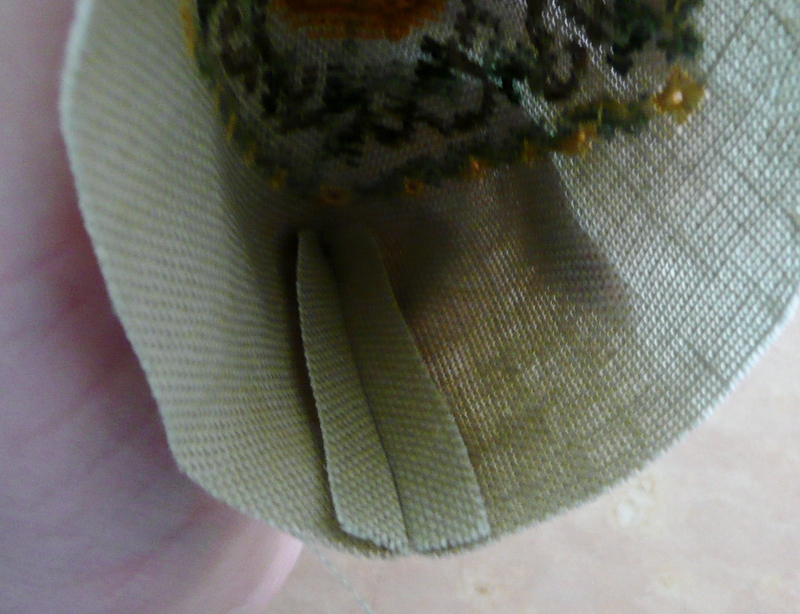 As it is hard to see my thread on the fabric, I have highlighted with red stitching where the seam line is below. I usually prefer top snip the corners slightly to make them easier to make ‘points’ once they’re turned the right-side-out. 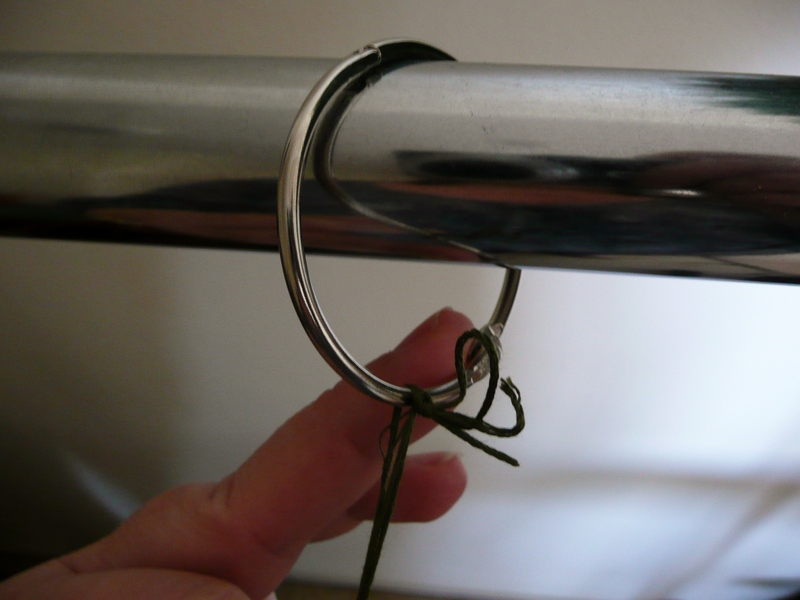 If you do this, make sure you don’t snip them too close to the seam line, or it will unravel, and you don’t want that! 3. 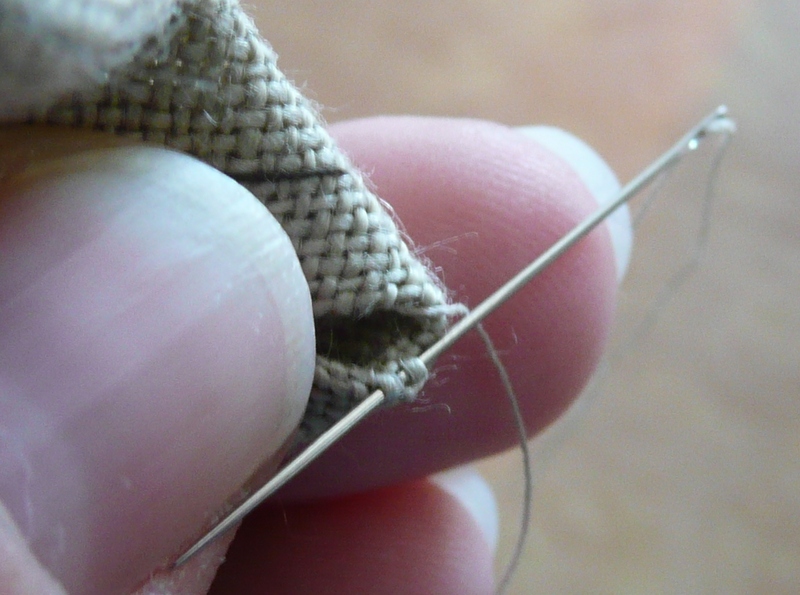 Now turn your stitched piece inside out, and put out the corners – sometimes I use a pointed chopstick to help get a nice point in the corner, but this needs to be done gently so you don’t poke a hole in the fabric! 4. Next we turn over the seam allowance on the top raw edges. I prefer to give the seam a quick iron to make it sit flat. 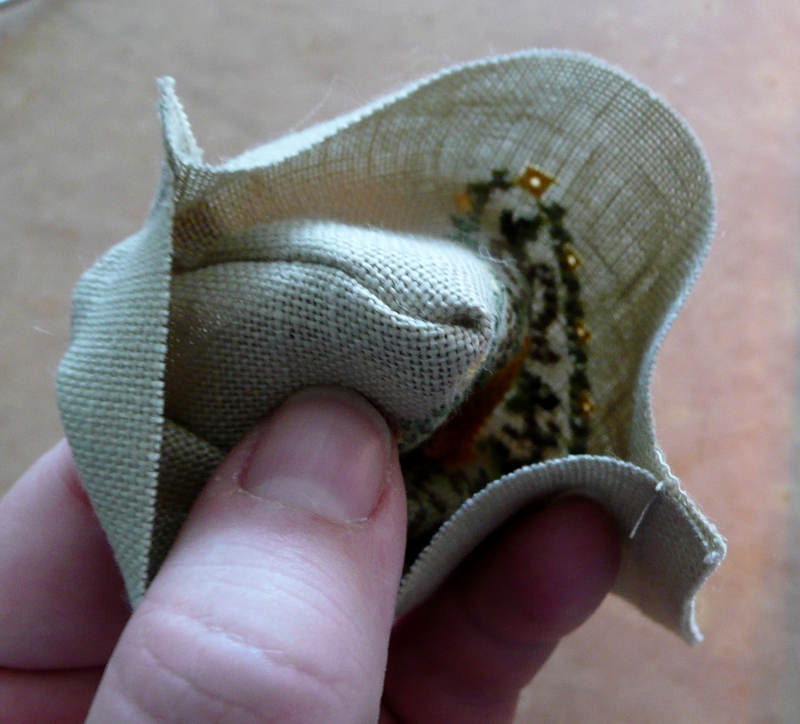 You can just pin the seam allowance down around the top, or do as I do which is to baste it down using a contrasting sewing machine thread. 5. 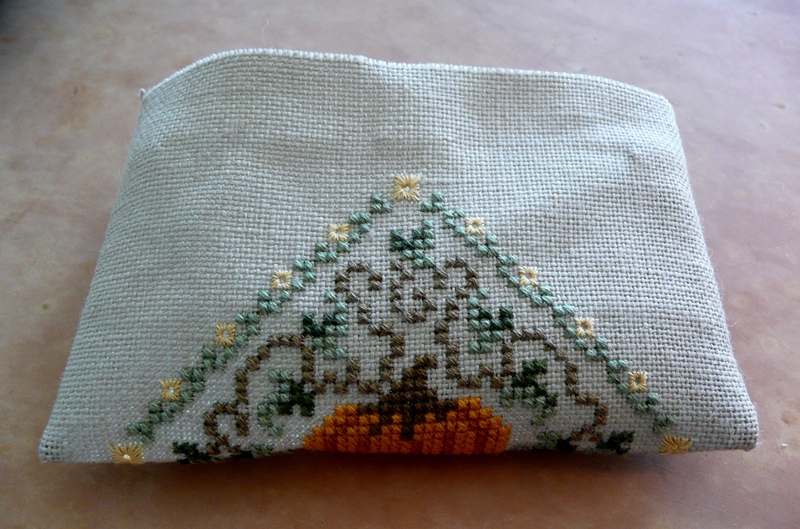 Next bring the two seams together to meet in the centre, and your stitching is in a diamond shape. 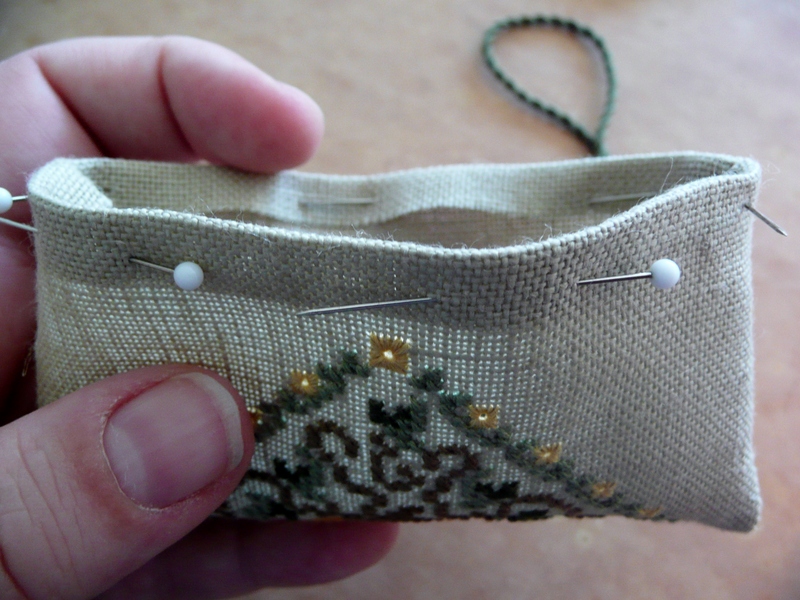 I usually pop a couple of pins in temporarily to hold the seams in place. 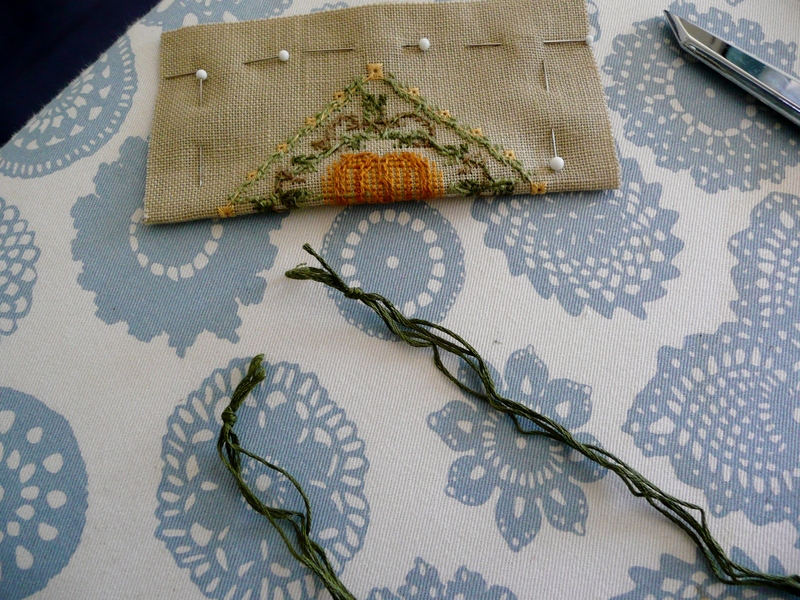 Turn your piece over to work out which is the top of your stitching, and where the cord will eventually be attached. In this tutorial, because the fob is so big I’ve decided to just have a cord hanger at the top without any tassel or embellishments at the bottom – another tutorial will cover the option of adding tassels to your fob later. 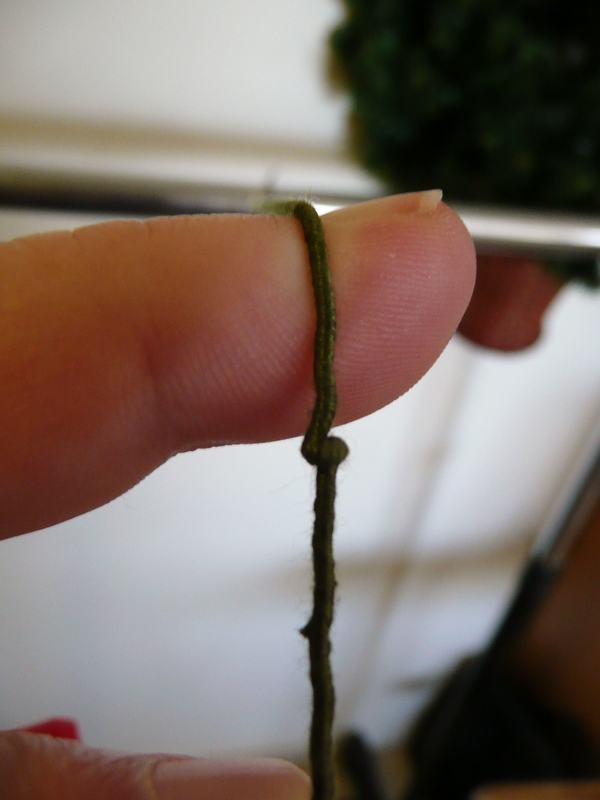 The first thing to do is to knot each end of the group of threads together. 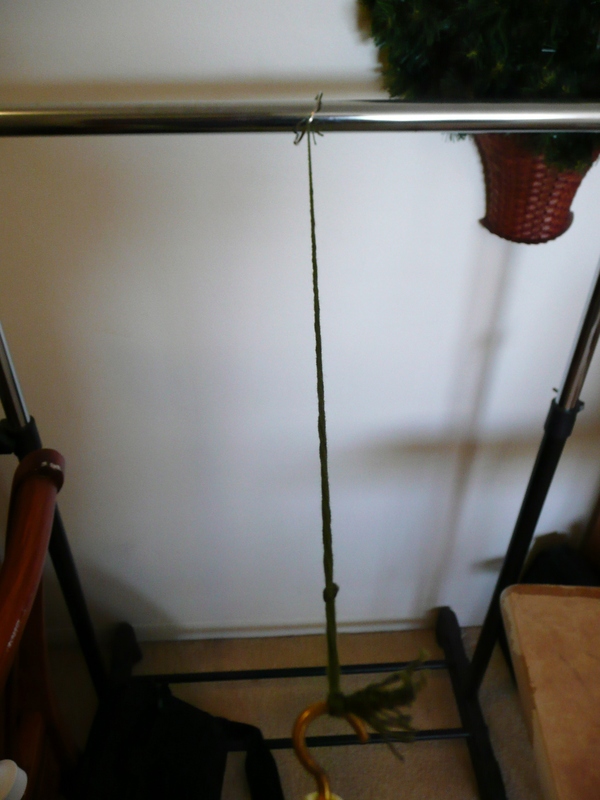 Next you need to rope in an assistance to help out by holding one end of the threads tightly, or do what I do by finding something you can attach the other end to … in my case I have a portable clothes rack that I used, by snapping a metal ring over the rail and hooking the ring through the middle of the threads at the knot end. 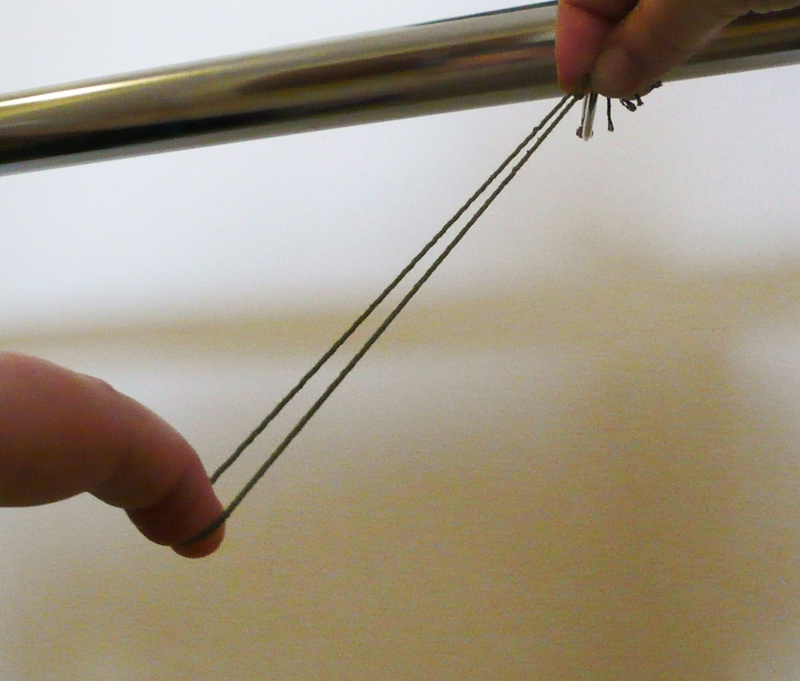 Alternatively you could tie the end around a door handle or something similar. 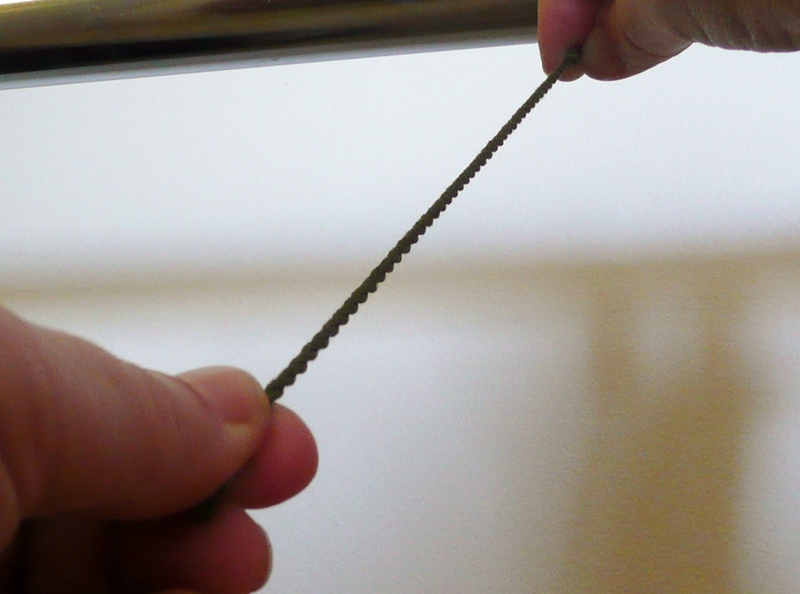 If you have a cord drill, that’s perfect, otherwise you can make do by using a simple pencil to wind the thread. 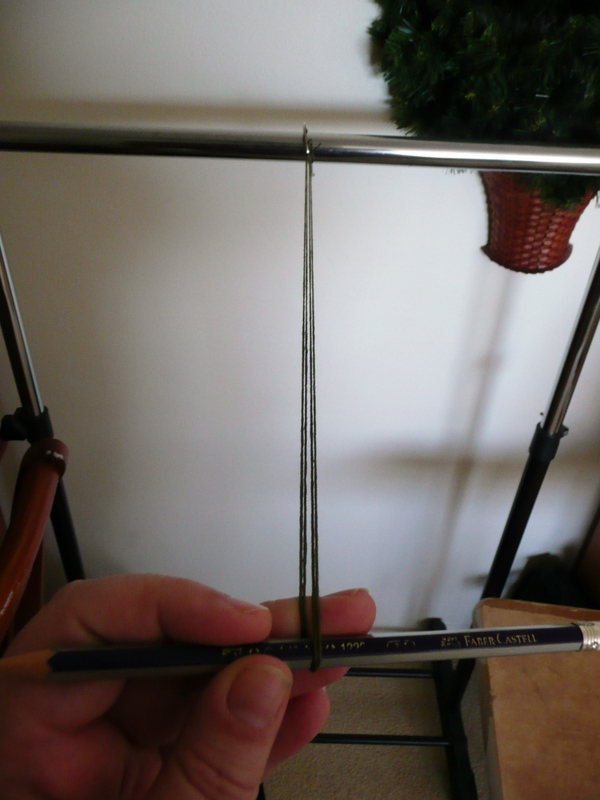 Take your pencil and insert it through the middle of the remaining end of the thread (at the knotted end), and walk back until your thread is nice and straight. Then start turning your pencil – it doesn’t matter in which direction you turn your pencil, as long as you continue to turn it the same way 😉 I prefer to use a cord drill as it’s so much quicker, so that’s how I finished my cord off this time round. 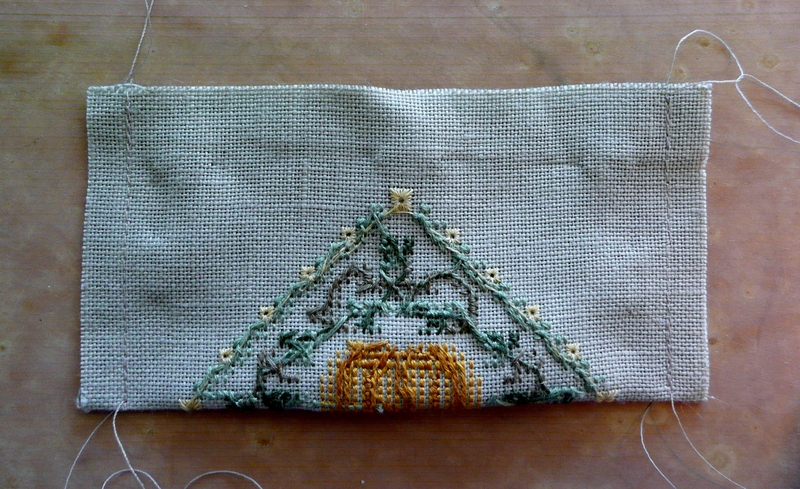 You need to keep turning your pencil/cord drill until your threads are very taut. 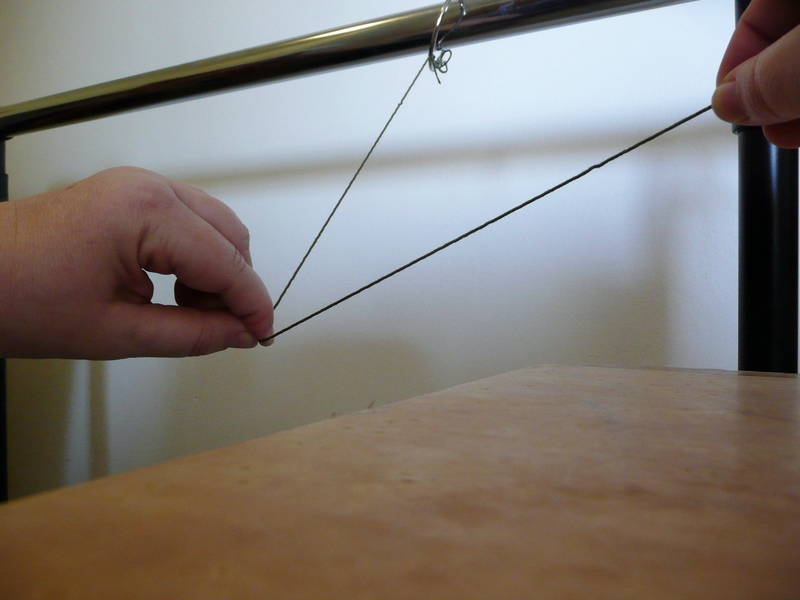 If you slacken off your tension a little bit and your thread starts to ‘kink’ and turn on itself it’s generally twisted enough. 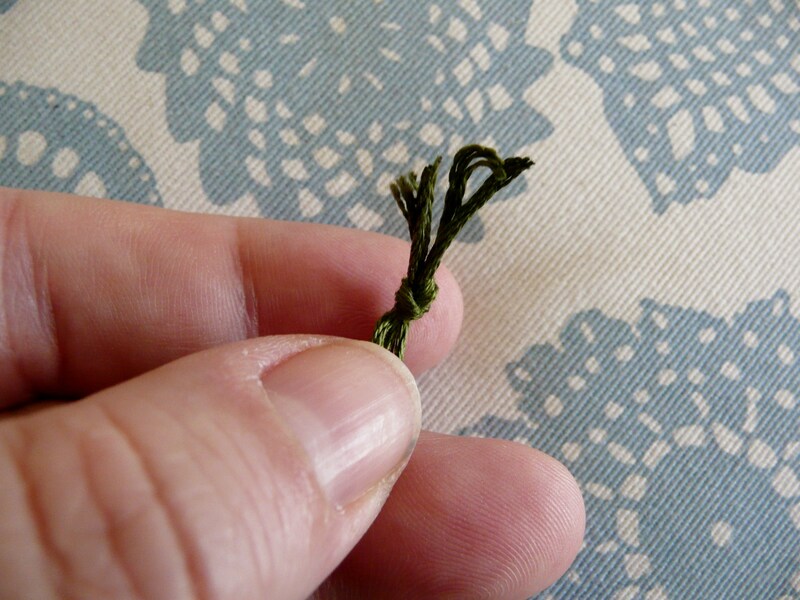 I let go of the tension a little bit here so I can hopefully show you what I mean about the ‘kinking’ of the thread. 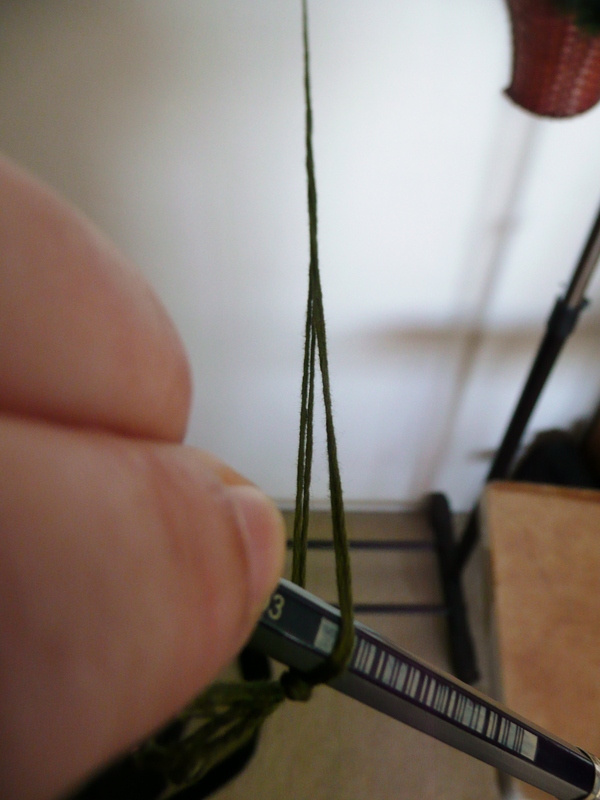 This next part is very tricky to photograph as I needed both hands … Once your thread is twisted enough, carefully hold the middle of your twisted thread with one hand, then using your other hand bring the two knotted ends together. 7. Decide how long you want your cord to be – generally 3 1/2 to 4 inches is about the right length, but you may prefer to have your hanger longer than that – it’s all personal preference! 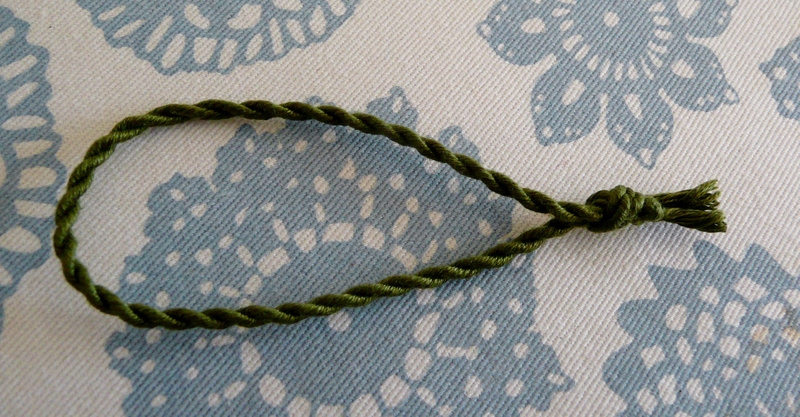 In this case I’d made my cord quite short so I could do the tutorial easier for you. Knot the two loose ends together at your desired length. 8. 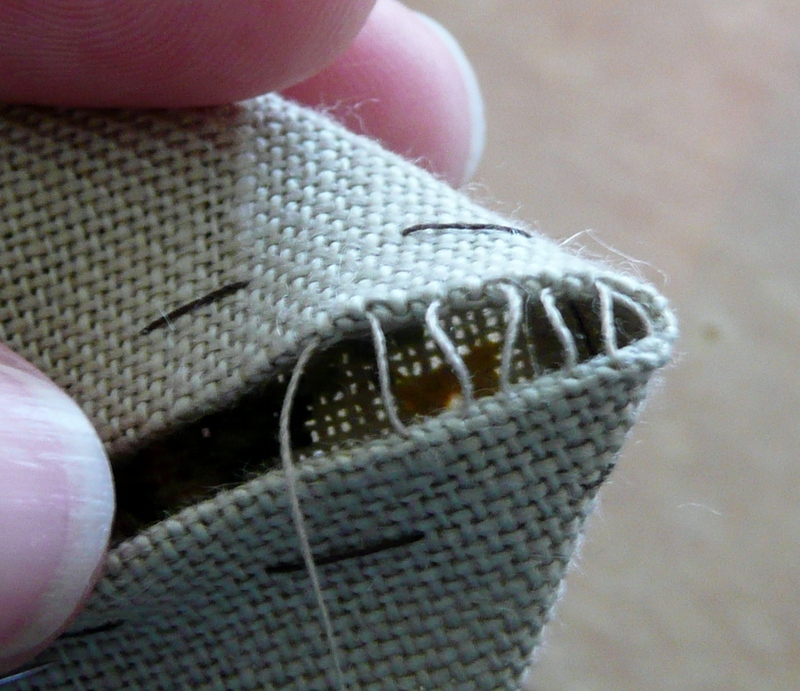 Now it’s time to pick up your stitching once again, and we need to start stitching up the remaining seam. 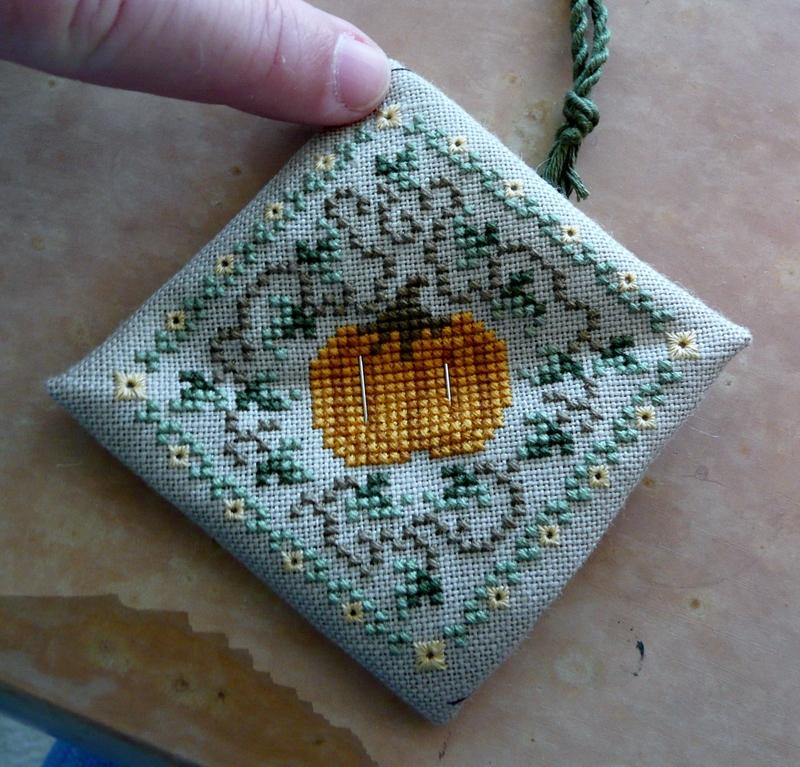 My preference is to close it up using a ladder stitch, however you can use a whip-stitch if that is easier for you. 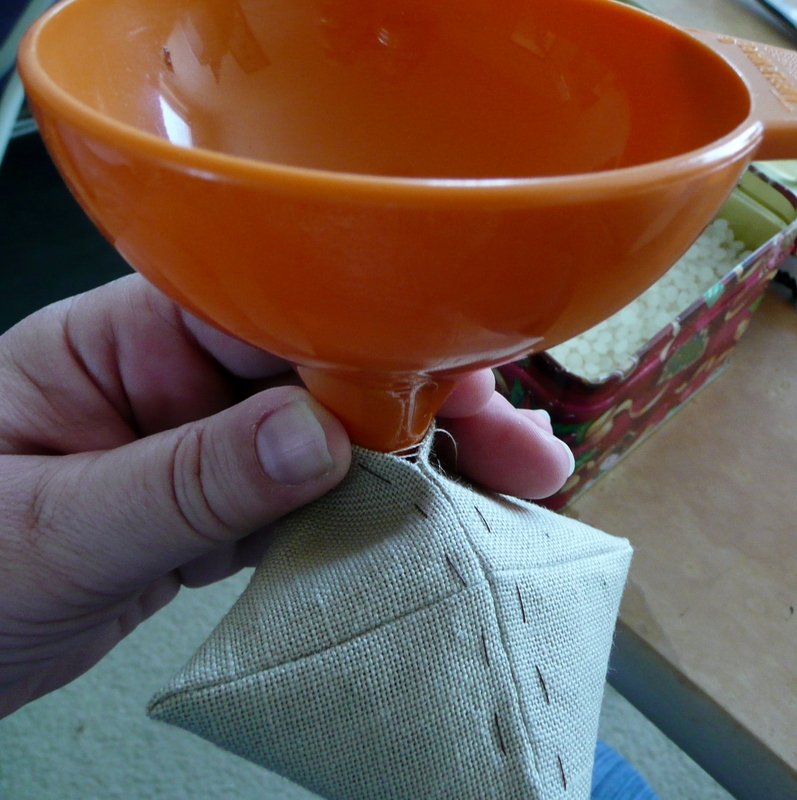 Start at the bottom of the fob, away from where the cord will be inserted. 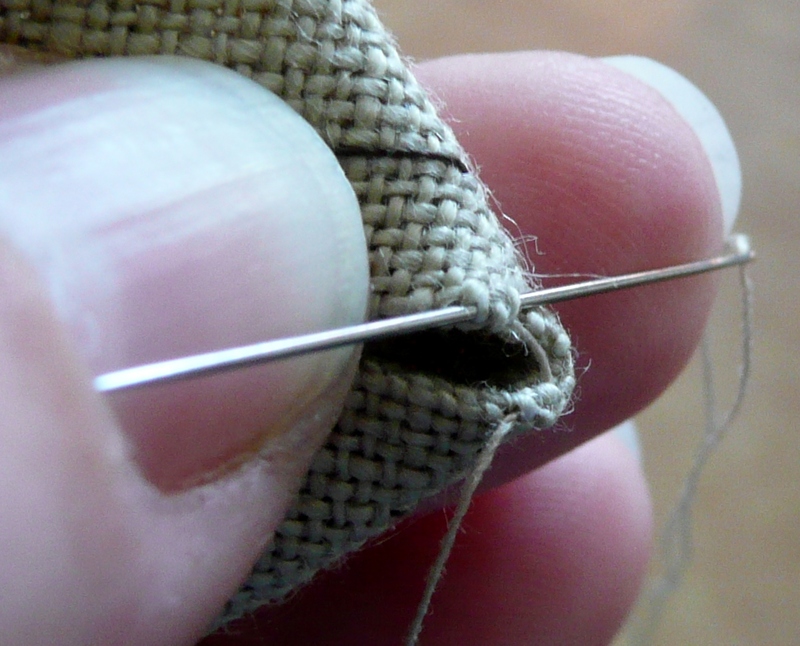 To do a ladder stitch you just work your way alternatively up each side of the seam, taking a few threads in your needle for each stitch – this looks like the rungs of a ladder when the stitches are loose, and when you pull them tight they close up the seam very cleanly. 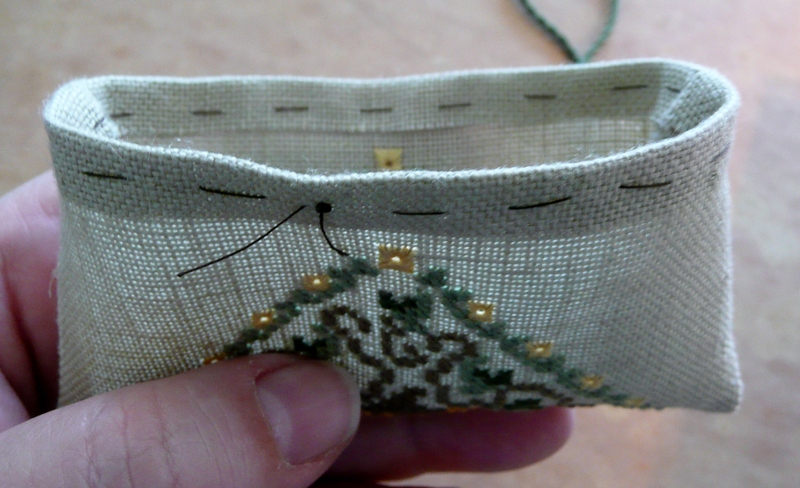 Keep stitching up the seam until approx 1″ away from the end. 9. At this point you insert your chosen stuffing. I have opted to use teddy bear pellets for mine, as I really like the extra weight it gives the fob, especially for smaller fobs (in hindsight I probably should have used Polyfil for one this big!!). 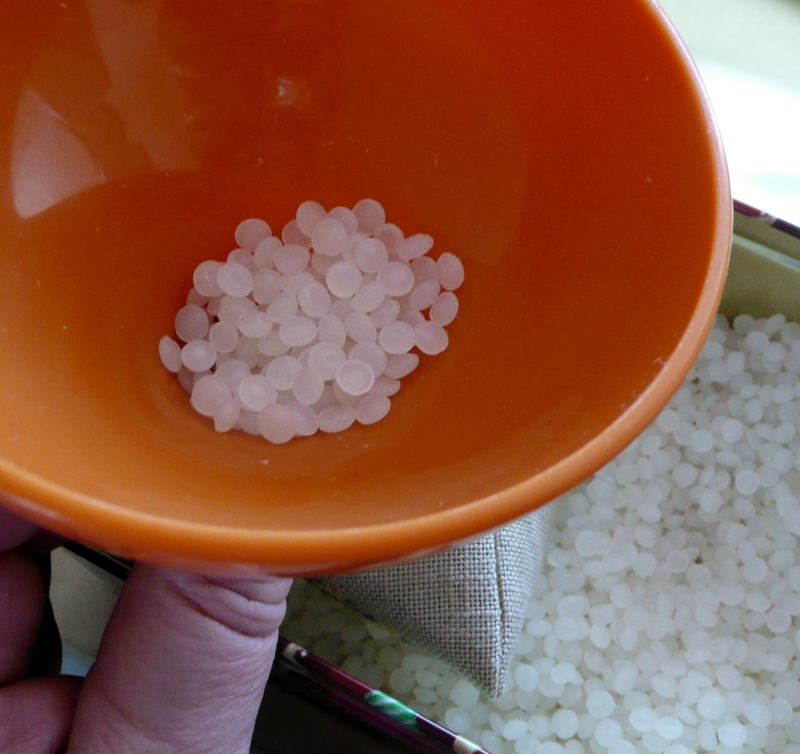 When I stuff with pellets I use a little Tupperware funnel that I find really useful for this job – alternatively you can roll a piece of stiff paper into a funnel instead! 10. Now we’re on the homeward stretch, and it’s time to add the cord and close up the seam! 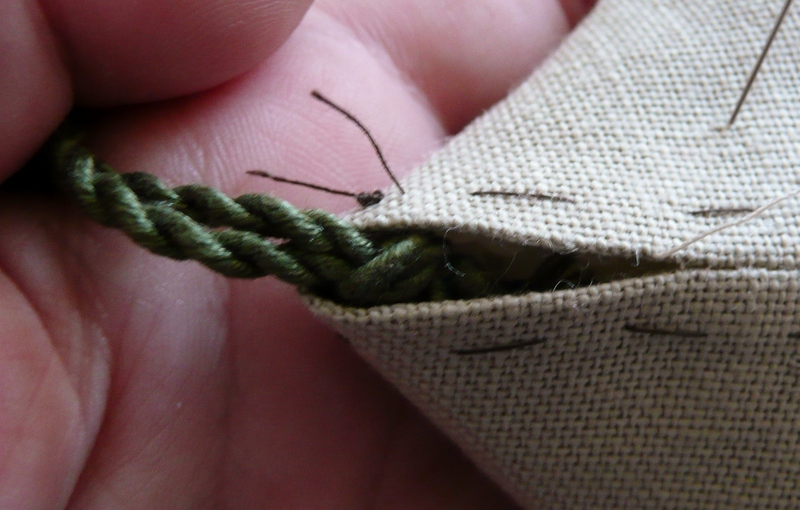 Take your cord, and place the knot inside the seam opening, then continue stitching up the opening to the top. 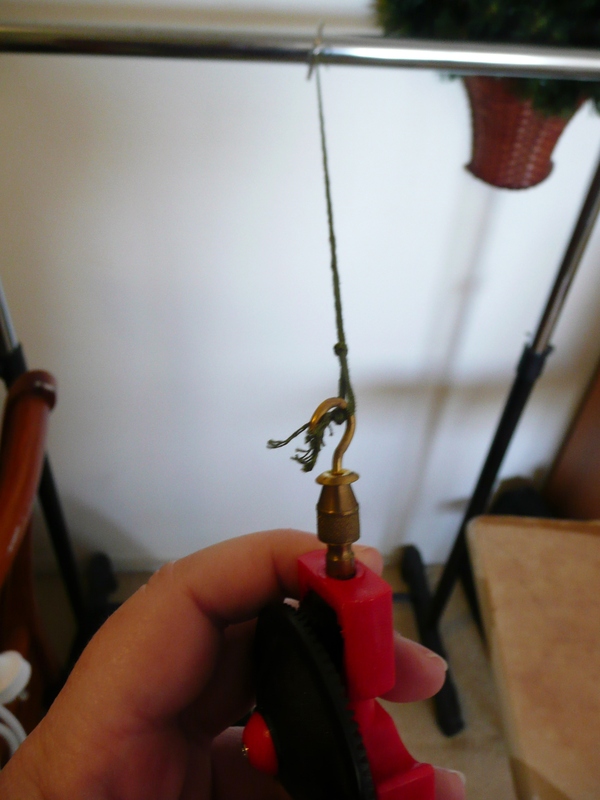 Sometimes I will take my thread through the cord at the top to stop it from moving around, but it wasn’t needed for my fob this time. You can now remove all your basting stitches. And that’s it, your fob is all finished and ready to adorn your chosen pair of scissors!! As always, please feel free to leave comments and let me know if you have any questions. It’s always good to know if you find the tutorials useful, or if there is something you would like to see more of, so the comments are always appreciated! 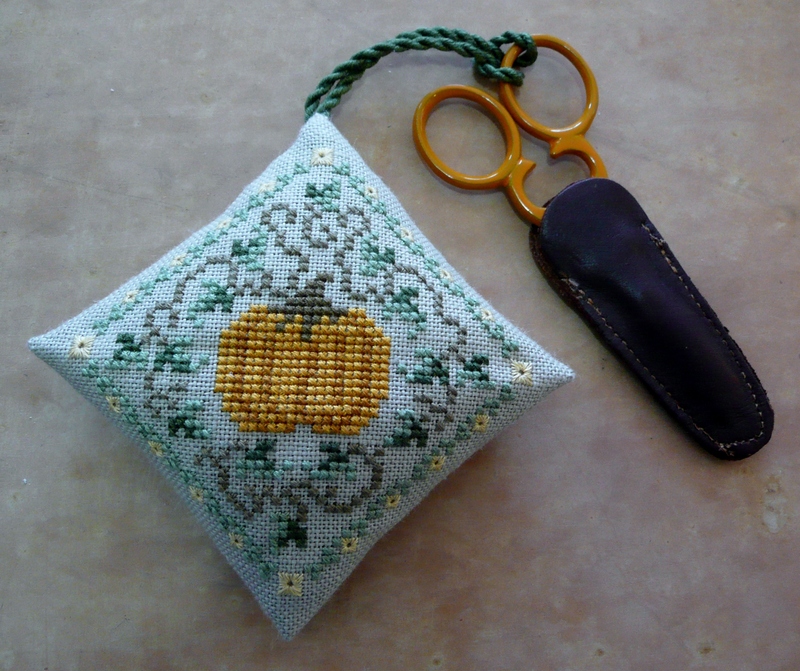 Anne S • This entry was posted in Cross Stitch, Finished Items, Finishing, Focus on Finishing, Scissor Fobs, Stitching Smalls, The Drawn Thread, Tutorials and tagged scissor fob tutorial, scissor fobs, Tutorials. Bookmark the permalink. once i gather all the material..